Rhitrogena haarupi, belonging to the Mayfly family, is what our artificial March Browns are supposed to represent. The insect exists in fast flowing waters only, nevertheless it fishes very well in our still waters. It is best used as a top dropper, and not only in march, but throughout the entire season.. In the upper regions of our rivers it can produce surprisingly good brown trout after a spate. Variations over variations and subspecies invite to experiment with colours and materials; the one which has done best for me is this spider version: hook sizes from 8 to 12, with 10s and 12s being the most used ones. A little grocery shop on an elevation represented the limits of the seven-houses village Podturn. A bit below, nicely circumvented by a narrow road, a wooded hill in the background was the source of the Radejsica. The river came out of the hill, formed a pond and ran from there through an idyllic valley; that looked lovely: meadows and a few cornfields, no houses until its confluence with the Krka, somewhere in the distance, where a ridge of mountains rose. Gin clear water came out of the Karst rock stratum and it was a river right from its source on; twelve to fifteen meters wide and two deep. Gustl the landlord of our Gostilna, guesthouse and fishing permit outlet, had used the word Origin, which seemed very appropriate to us. Standing on that little circular road, we saw the rings of rising trout. You fishing with fly? asked Gustl and we nodded enthusiastically while he was issuing day tickets to us. That verry good. Because is only fly allowed in Radejsica. Helmut looked at me, and I must have looked astonished myself: was it really necessary for them to go that far? For someone being used to the entire bait and lure range this Fly only restriction was quite incomprehensible. Regulations and explanations were printed on our permits in Yugoslavian, German and French. Brown trout, potocna pastrva: Rainbows, kalifornijska pastrva and Grayling, Lipljan, we read. Three fish a day was bag limit. First we had to fish our meagre fly fishing tackle out of the car; spinning rods, fixed spool reels, loads of nice little spoons and spinners remained in the vehicle. 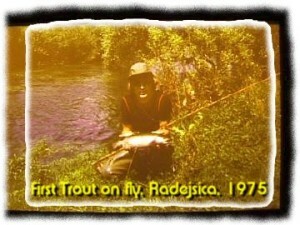 Then we fished the entire Radejsica down, 6 km from its source to its entry into the big Krka. There was fish, lots of fish, they were good to see in that clear water, lurking behind the weeds for nymphs drifting along; or hovering in more free water on the lookout for flies on the surface. We saw them rise, especially the graylings in the lower part of the river seemed never to stop. For days we tried in vain to catch a fish on the fly, and we didn't smile that friendly back when Gustl took our money for the permits, only to release us for another days fishing with his notorious: now poor fishes. Does he want to make fools of us? One evening we showed him our flies, asked whether they were any good at all. He pointed out a few brown patterns: this here very good flies; and we knew anyway that we were doing something wrong; fish were there. For starters our casting was pretty pathetic; the lines flew in wide bows and loops around our ears and never landed where it should or worse, got caught in the grass or bushes behind. There was an apple tree: I just had to get near it and was tangled up in it. But we were alone at the river, there was no danger of derision and laughter from more advanced fellow anglers. So we grumbled and cursed quiet and alone, getting the flies out of trees and shrubs, corn cobs, tufts of grass. The only interruption was the daily appearance of a small fat man with a thick heavy moustache, who rode his motorbike along the narrow tracks in pursuit of anglers. The Fish General wore a fancy old uniform; a heavy revolver in a holster gave authority. He asked, always friendly, for the Kontrolni Kupon, a little tear of part of the permit which he had to produce to the Fisheries Board as proof of his activity. If nothing happens tomorrow, I'm going to give this up! 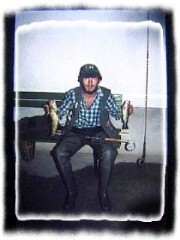 Helmut sat dejected at the dinner table, and my hopes of finally catching a fish here weren't exactly high either. It was raining heavily the next morning, so I decided to drown my grief. Sljivovica and Pivo Varna, right after breakfast I went to sit with a few hunters and woodsmen for drinking companions in the smoky Hunter's Lodge. Helmut went fishing. Sometime in the early afternoon, still raining heavily, he stuck his head around the door, totally soaked, and announced excited: I've hooked a giant fish, really, on the fly, but it got away! He didn't like our bursting into laughter, boozy bloody lot, and he was gone again. The next day was hard: just able to drive Helmut to the Gostilna, so that he could get a new permit for the day, I spent most of the morning lying in the car, a severe headache and general feeling of misery, made any activities of my own impossible. Just stayed in the car and tried not to move. After a few hours something forced me out, something dragged me to the guesthouse. I bought a ticket and walked to the river. 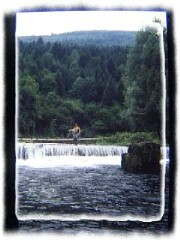 Helmut fished a short stretch of water just below the Orrigin , where he had lost his fish the previous day. Like in a trance I placed myself beside the before mentioned apple tree, took a brown fly (later I was told the name of that particular pattern: March Brown) from the remainders of my assortment, attached it to the end of the cast and began to work. Something in the middle between roll casting and line mending brought the fly a few meters out. The right hand, holding the rod, performed movements, very similar to stirring with a whisk; much slower though, to allow the currency to pull some more line through the rings. The split cane rod was ten foot long and I leaned forward a bit, carefully, while stirring, so that the fly did not swing round close to the bank. I didn't feel or see the take, just saw the splash at the surface, the line was pulled from the reel. I was totally frightened, had never reckoned that something like that might happen, and: it wasn't actually me fishing there, it fished, worked by itself, there was just no tension anymore. A rat, Helmut, I've hooked a rat! My panic stricken shouting must have informed the entire countryside. Helmut came with the landing net, said something about loss of sight in connection with exaggerated alcohol consumption, then we landed a 48 cm long rainbow trout and were very happy: so it works, after all. 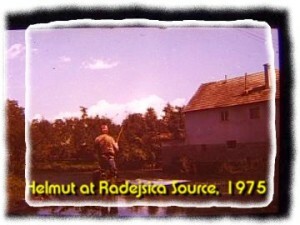 Again worked my line onto the water and immediately had the next take, at the same spot; Helmut netted again, and straight away another time. Now three fish lay there in the grass, caught within a half hour; suddenly the previous days didn't exist anymore, struggling and frantic didn't exist anymore. In the evening we sat on the bench beside the guesthouse and received congratulations all over: dobro ribar; master-fish-hunters. The rods leant against the white washed wall of the house, the top of my split cane fairly crooked. Gustl looked at the thing, nodded contented like he was saying: they are out of the wood.